Buffer is an innovative and much requested online service for PC browsers and mobile devices that can help you better manage your online presence on various social networks. If you ever prepared messages to be sent at the later time, now with Buffer you have ability to put them in the queue and schedule them for release at specified times. This will enable you to satisfly your friends, family, and readers with the content that is targeted for regular release, fill the gaps during times when you don’t have access to the web, or better organize your media market campaign that relies heavily on precise timings. Whether it is text, images or video, Buffer will enable you to share them however you want and whenever you want with a simple click from your internet browser. The best way to control, manage and share on social media! When Buffer appeared on market during late 2010, it promised to everyone access to onecentral dashboard where they could manage what will be posted on their twitter account. Simply prepare how many tweets as you like, align it with your brand marketing plans, promotion schedules, and other tasks, and then simply focus on your other work while Buffer takes care of deployment. This simple approach brought untold increase in productivity for many professionals, making this service one of the darlings of the social marketing sphere, with phenomenal reviews from internet media. Now, more than 3 years later, Buffer has managed to greatly expand its service, offering its users access to the automated message posting not only for twitter, but also for many other popular social network destinations such as Facebook, LinkedIn, Google+ and others. Currently, Buffer manages to attract more than 1.1 million concurrent users who all share more than 100 scheduled updates daily to their target social network destinations, making their social network presence consistent and reliable. Basic feature of Buffer is its content scheduler, in which you can insert as many social network messages as you like, set their deployment times and then let the Buffer work and slowly release them into public. You can schedule as much posts as you like, there are no limits, no matter how many social networks you are contacting or how many separate accounts you have on them. Currently Buffer supports 12 most popular social networks in the world (Twitter, Facebook and LinkedIn, …), and in most affordable pricing plan all of the management can be done with 2 team members in close collaboration. Off course, if your business requires more robust access to accounts, you can elect to try premium plans. Recently, Buffer changed their user interface by introducing much more logical, streamlined and usable web tools, enabling you to take much better advantage from all tools and features it offers. Now you can easily browse each of your social network accounts, and set scheduled messages for each of them separately, see their analytics, manage messages, tweak settings and more. After recent UI change, Buffer is now home of one of the most usable interfaces you can find in the field of Social Media Services. Its dashboard features very nicely arranged white theme from which you can access all your social networks and multiple accounts on them. Dashboard consists from vertical list on the left side of the main work area that holds all your accounts, and above work area each of those accounts has separate tools for Buffer messages (database of messages that still need to be sent), Analytics (detailed tracking data about user engagement with each of your messages), Scheduling (very detailed) and Settings. 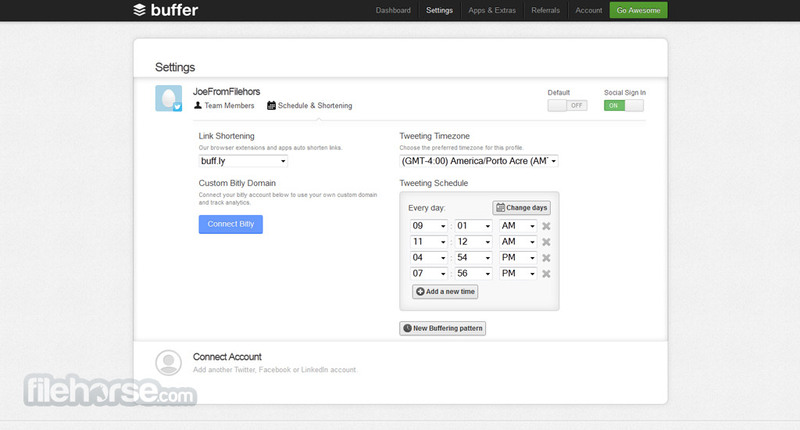 Buffer offers free account creation and access to its service in a trial period. 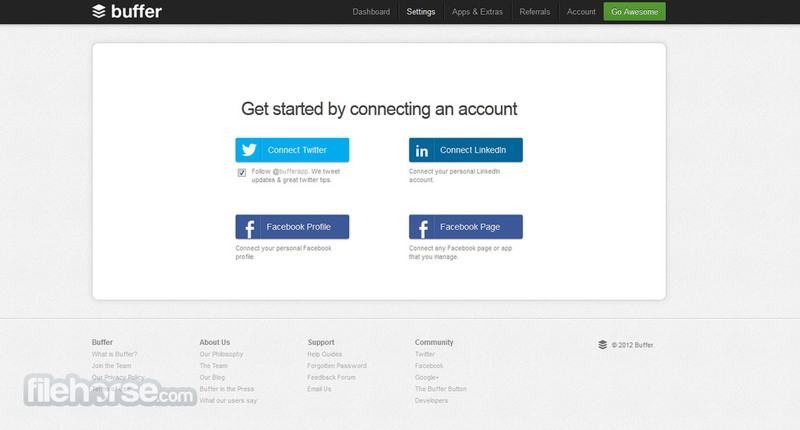 New account can be made with valid email, or by using your Twitter, Facebook or LinkedIn credentials. The basic tier of use costs $10 per month, which gives you access to all 12 supported social networks, collaboration with two team members, and ability to post unlimited amount of messages. Buffer is a service that deserves its many 10/10 reviews that it has received from many internet reviewers and famous sites. It’s fast, reliable, beautiful, usable, and offers really great service and can be tested for absolutely free. We fully recommend it. A Smarter Way to Share on Social Media! Post to your Facebook, Twitter, LinkedIn and App.net accounts easily and quickly from wherever you find great content! Using the Buffer button and browser extensions for Chrome, Firefox and Safari share any page in seconds! We have native apps for iPhone and Android that make sharing on the go super quick and easy. 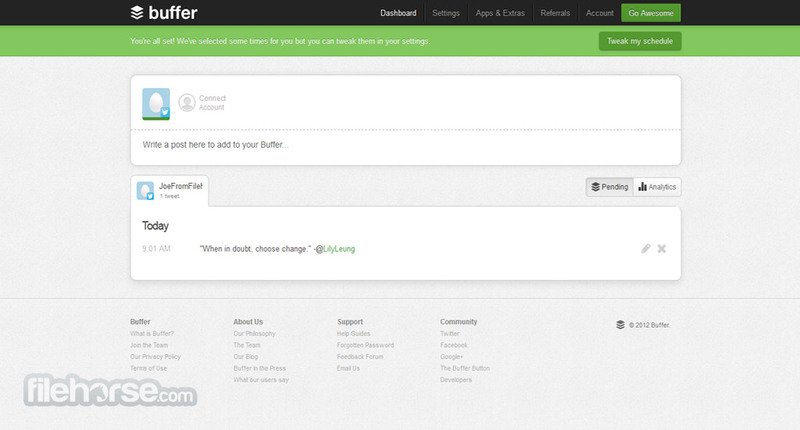 We have integrations and compatibility with all of the major news reader apps - use Buffer from your favorite app.